Deep Water Oil Wells Stink, What About Deep Water Wind Farms? Deepwater tech may be in an, ahem, black spot in its history at the moment, but these sort of deep ocean mega-constructions aren’t just for oil. 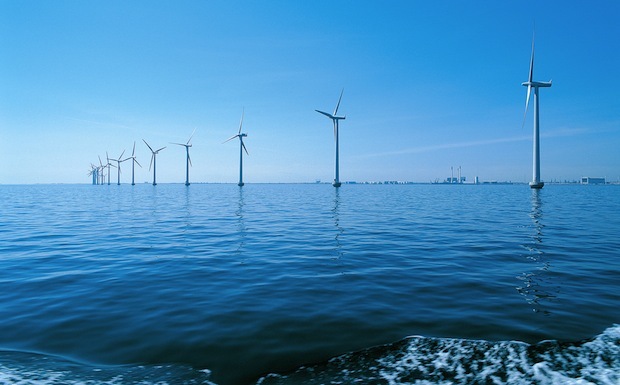 How on Earth do you affix an offshore wind farm in ocean waters over 300 feet deep? GreenTechMedia has a piece examining an industry you may never have thought about: Research and development of offshore wind farm technology. Wind-generated electricity is one of the easiest ways to reap the megawatts of solar power hitting the Earth’s surface, of course–but land-based wind farms frequently suffer the Not In My Back Yard syndrome, and locals oppose them on all sorts of (mostly) fantastical grounds. But the vast majority–some 83%–of the U.S.’s useful harvestable wind energy is found not on land, but in the country’s territorial ocean areas, up to 56 miles off the coast. Much of this zone is in waters that qualify as “deepwater” ocean, with depths over 300 feet. And this depth brings all sorts of technological challenges: BP’s beleaguered Mexican Gulf well is around 5,000 feet deep, and look at the difficulties this has caused. Think about how you’d anchor a huge windmill in an ocean zone like this, and you’ll get a vague sense of the sorts of issues that the DeepCWind Consortium National Research Program in Maine is trying to tackle. This new body is trying to work out how the U.S. can meet the DoE’s ambition of having 20% of U.S. power sourced in windmills by 2030, and it’s tackling some unique problems. For example, what kind of structural loads will result from ocean currents on a floating platform and wind stresses on a platform top-mounted windmill, with the two forces not necessarily being predictable from minute to minute? If you moor the platform to the ocean floor with wires does it make things better? How do you make this mooring work? What happens if you weigh the floating windmill base down with ballast, and then a really high sea whips up? Even building mathematical models of this sort of problem is tricky, given the fickle nature of true ocean environments, and the predictably chaotic nature of wind and water flowing past turbine blades and floating platforms. Then there’s the impact on marine and bird life to consider, along with the task of making future wind farms easily spottable by cargo shipping. In comparison, the task of blocking an inches-across tube stuck motionless in the sea floor off Louisiana looks simple. But this sort of research is going to be vital if ambitions for greener electricity production are ever to be reached. And for reasons why it’s important to get things right, just remember those horrid pictures of the oil spill in the Gulf as an incentive to pursue non-oil alternatives. And to understand why research like that of the DeepCWind group is important, check out this video of a land-based windmill failing in storm-force winds in Denmark.